What wine should you choose for your dessert in a restaurant? When you dine with us, our main aim is not to fill tables two, three, or four times an evening; it is to ensure you have a pleasant, relaxing experience. When you sit down for dinner at Christopher’s, you have the table for the whole evening, if you wish. And that means taking your time over dessert. What better way to do so than with a fantastic dessert wine? Here are our tips to choose which wine to pair with your dessert, as you enjoy the company of your guests without the pressure to vacate the table. Most people think that a dessert wine should be sweet and light. In fact, the way to choose a great wine that complements your dessert and take the taste experience to a different level is by following the food and wine pairing rules for dining out. Fruits have natural acidity, and an acidic wine will make this characteristic pop on your tongue. The more intense the flavours in your dessert, the more intense your wine should be. 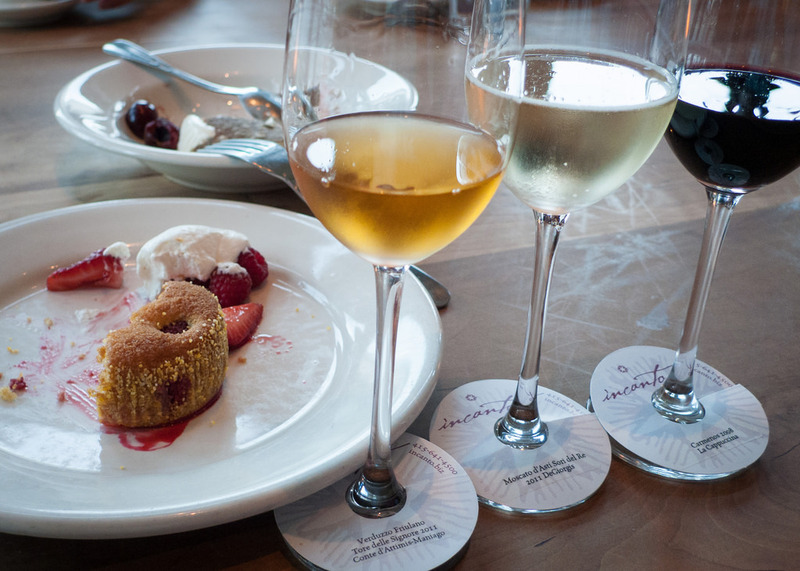 The wine you drink with your dessert should be a little sweeter than your dessert. Such as our homemade Italian-style panna cotta, or our ever popular liqueur ice creams. For such desserts, choose a mild, light, buttery wine – a Riesling or Demi-Sec Cava are perfect. If you fancy a slice of our warm apple strudel with a honey and cinnamon glaze, or fruit crumble with vanilla crème anglaise, then choose a wine with undertones of apples, pears and cinnamon. A white wine such as a Sauternes or a pink Cava would be ideal. With a deep, full-bodied dessert treat like a warm chocolate fondant with chocolate sauce, opt for a darker, richer, caramelised wine – red wines such as pinot noir, Grenache, or port. And talking about port, like Champagne and Cava it is so versatile that you could drink it with any dessert. And then continue as you allow your meal to settle and enjoy the remainder of your evening before rounding off with a liqueur coffee. If you are still not sure which wine to select with your meal, never be afraid to ask the maître d’ for their recommendation – you may be surprised to discover the difference it makes to your dining experience.